Walk into a room with a crowd of people and heads will turn. You're wearing fine solid gold (that's what they think.) It will look stunning and beautiful and you'll create an effect, But, nobody will know it's not solid. That's OK - we'll never tell! Our jewelry is made from REAL 24K Gold over semiprecious metals. We use extra layers of gold to help it resist tarnishing and to look authentic. Because it is an overlay, there is a 0.5% chance it would ever get damaged or worn. Should a defect occur, simply send it in to us and we'll replace it for free. There is NO TIME LIMIT! We've created each piece with a quality tag to show it's real gold layered over a core of semi-precious metals. Each tag is inscribed with "LJ 24KGL" to mark its authenticity. TIRED OF BUYING CHEAP LOOKING PLATED BRACELETS? Look no more. 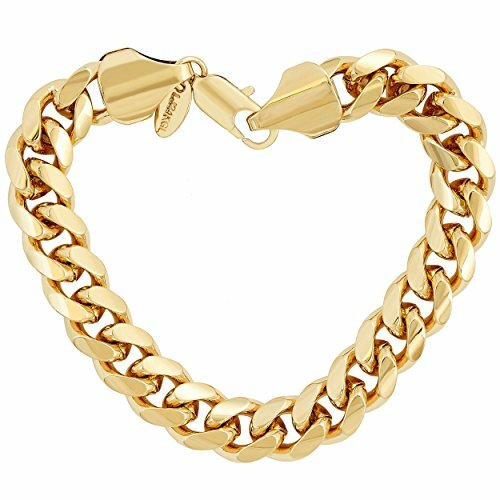 This beautiful Lifetime Jewelry 11MM Cuban Link Bracelet is gorgeous! It looks and feels like solid gold and is sold at a fraction of the cost. Comes in a box or pouch for easy gift giving. YES, YOU CAN BUY AN EXPENSIVE SOLID GOLD BRACELET, but that's an investment. It's also not likely you would wear your expensive jewelry just anywhere. It's risky and could be life threatening. You can wear this anywhere. What's the point of owning a solid gold bracelet if you can't wear it? UNCONDITIONAL FREE LIFETIME REPLACEMENT WARRANTY! You not only save money for more important things in your life, but you can wear this jewelry anytime anywhere. Eliminate the uncomfortable feeling that you may be robbed or lose it. Replacing it is easy. Should some defect occur, we'll replace it for FREE FOR THE REST OF YOUR LIFE! SPECIAL CONSIDERATION FOR SIZES. We offer this 11mm Cuban Link Bracelet in 8", 9", and 10" to accommodate hands of all sizes. OUR MISSION IS TO HELP YOU LOOK YOUR BEST with the finest fashion jewelry in the world. We match that with unparalleled customer service and you have something unbeatable. We believe in enjoying life, having fun, and pursuing our dreams. LIVE, LOVE, LAUGH!